As the moderator of the Fred Miranda Macro Forum Mr. Tom Hicks has been a huge influence on a number of macro and closeup shooters, yours truly included. I often marvel at Tom's compositions and his use of any light source and I cherry picked the best of what I saw him doing and rolled it into my own photography. Next to Mark Plonsky I consider Tom to be one of my mentors, and I probably hold the record for the most posts at Fred's that start with "Questions for Tom". He's so talented with a wide range of macro hardware and techniques that I think if there is anyone on the planet who could cut the end off of a Coke bottle and shoot macro with it he could! So it's my great pleasure to present to you No Cropping Zone's next Master of Macro Tom Hicks! NCZ: Who influenced you early on when you first got into macro? Tom: My greatest influence in to the world of macro was Mark Plonsky. His was the first work that exhibited the quality level that I wanted to achieve. It also amazed me that he was able to get all that detail with the simplest of tools. Mark and I try to touch base every so often, but it has been awhile . Hope all is good my friend! NCZ: What is it about macro that has you hooked? 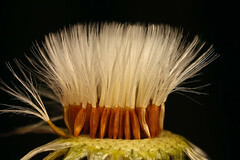 Tom: Macro Photography has always held my attention. It's the smallest of details in the subject that you shoot that I find so gripping, the things that we normally don't have the opportunity to see in our every day lives. Things that we all take for granted. NCZ: What is your favorite subject to shoot and why? Tom: Bugs are my favorite subject but more specific, Robber Flies. 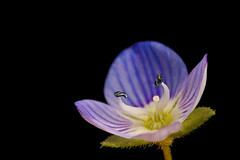 I never new they existed until I got into Macro. The first image I saw of one was posted on Fred Miranda.com by my European friend and photographer Monique Bogaerts. A very fine Nature photographer in her own right, and one I have the utmost respect for. 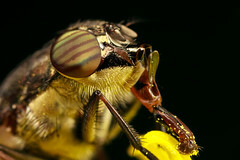 With over 4000 different species of Robber Flies there is certainly no shortage of subject matter. They are the Raptors of the insect world, and upon close study, hunt their prey just like our feathered friends do. NCZ: If you could only have one lens what would you choose and why (assuming that you also have access to any light source you want as well)? Tom: If I could have only one lens for Macro it would be one on the 180 to 200mm range and have a tripod foot. I learned at the very beginning that working distance is your friend. I also prefer the narrower angle of view because it can help to isolate your subject from distracting background clutter and also provide you with nice bokeh. NCZ: What lens do you recommend for someone who's just getting into macro? Tom: For the beginner a lens in the 90mm to 100mm range would be the best choice, both from a cost stand point and a selection standpoint. NCZ: Do you spend a lot of time in post processing or do you like to "get it right" with the camera? Tom: I prefer to spend as little time on the computer as possible therefore I do everything I can to get it right in camera, especially the crop. All I want to have to do is sharpen the image, and maybe add some contrast. If one will slow down and pay attention to all the things needed to get it right in camera it makes the whole process go much smoother. NCZ: Is there any advice that you’d like to pass on to the people reading this interview? Parting thoughts? Tom: Parting thoughts. For those thinking of taking on macro photography; find someone's work that you admire and study it, get the best equipment you can afford, keep it simple, if shooting bugs then study your subject. Shoot both natural light and flash and find out which you prefer. Practice, practice, and more practice. Learn from your mistakes and spend some time figuring things out for yourself, if that fails - then ask . NCZ: I'd like the thank Mr. Hicks for taking time out for this interview, and for putting up with all my stupid questions when I was a newbie! 40D and MT-24EX problem -I think it's fixed! For now I've gone back to the 40D -the 50D's noisy sensor was driving me insane! …before the bee would either feel or see the heat coming off of my hand and crawl onto it to warm up. From time to time I see people argue about the backgrounds in macro images, and about how dark backgrounds don’t look natural –whatever the heck that means. Seriously what’s natural about macro photography? Do you see all the detail in a bee’s compound eye or the tiny “hairs” that cover most leaves without the aid of some sort of magnifier? Take the photo with this post: I could have increased the ISO or decreased the shutter speed to get more of the ambient light into the scene, so that I could record the foliage behind that flower. But the junk in the background would just distract your attention from the subject –by setting the camera so that the flash was the only significant light source I made the subject stand out. Your eyes have no choice but to go straight to the flower and that’s exactly what I want them to do. The only thing that you have to do to really pull the effect off is to set a black point when you post process the image: A solid black point will keep the image from looking washed out. So what gear do you need to shoot above life size? A camera (preferably one made by Canon since they have the best macro glass), a lens (doesn’t need to be a macro lens, you can always reverse a standard lens to get above life size) and a flash (can be any flash, but due to my shooting style I prefer the balance of the MT-24EX), something to diffuse your flash, spare batteries for your camera and flash, and memory cards. That’s about it –the rest is technique, experience, and opportunity. 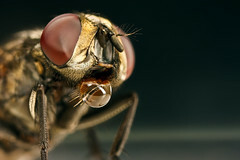 The photo I’ve included with this post is one my images from 2008 that’s really the end result of all the work I’ve put into technique: A fly actively feeding on pollen shot at four times life size with a Canon 40D, an MPE-65mm macro lens, and an MT-24EX macro twin flash with a modified set of Sto-Fen diffusers. Since it was windy it was easier to grab onto the flower with my left hand without scaring the critter off –it could not tell the difference between the vibration induced by the wind and the vibration induced by me. Once I pinch the stem of that flower between my index finger and thumb I can slowly rotate the flower and tilt it to keep the subject at the angle that I want to shoot, and by resting the lens on my left hand I can keep everything on the same “platform” –if one hand moves then they both move. Focusing is just a matter of sliding the lens on my hand, and since the depth of field is really narrow I refocus the scene for every shot and then choose the one I like best later when I get the images on my computer. The working distance from the front of the lens to the subject was 1.7 inches (4.3 centimeters) and the scene is about 5.6mm wide x 3.6mm high. It’s tough to put that into perspective, but a millimeter is about the thickness of a U.S. dime. The easiest way to get good light from the MT-24EX and at the same time do no damage to the flash heads is to simply wrap the outside of a set of Sto-Fen diffusers with Gaffers tape. The tape serves two purposes: To keep the Sto-Fens on your flash heads better than the shallow indent on the flash heads that the diffusers clip onto, and to force more of the light from the flash heads out the front of the diffusers to give you a shorter flash duration (less glare, easier to freeze motion, etc. ).